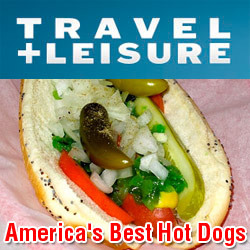 Since 1987, Hot Dog Heaven has been specializing in Authentic Chicago Hot Dogs prepared with Vienna Beef Products. These quality products are shipped from Chicago for the authentic taste. Hot dogs, buns, and the toppings are all from Chicago. We have chosen products from the Vienna Beef Co. because of their commitment to quality. Vienna Beef hot dogs are carefully made using lean bull beef and only beef, nothing artificial. Only 100% Pure Vienna Beef. ONE TASTE AND YOU KNOW, YOU'RE IN HOT DOG HEAVEN!! visit our contact page for our new hours"